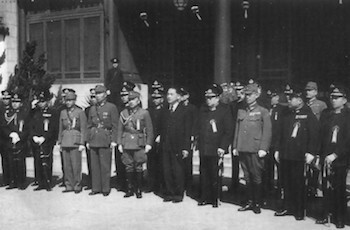 The Japanese set up a puppet government called Manchuko in Nanking, China. that are currently docked in American ports. The RAF makes a second unsuccessful attempt to sink the Tirpitz while in port at Trondheim. The 6th Chinese Army abandons Toungoo, and fails to destroy the bridge over the river Sittang as well. This leaves the way to the Chinese border wide open for the Japanese Army. The abandonment of Toungoo also exposed 1st Burma Corps left flank, whose attacks in the Prome area had been turned back by the Japanese. and forced to withdraw towards the Yenangyuang oilfields. The Allies formally divide the Pacific theatre into two commands. General MacArthur takes control of the South-West Pacific Command based in AustraliaÂ and covering the Philippines, new Guinea, the Bismarck Archipelago and the Dutch East Indies. The second command covered the remainder of the Pacific and came under the control of Admiral Nimitz, who was based at Pearl Harbor. His Pacific Ocean Command was then sub divided in to three, which were theÂ North, Central and South Pacific Areas. The Pacific War Council is set up in Washington, with representatives from Britain, Australia, Canada, China, New Zealand, Netherlands, Philippines and the US. Elements of the Eighth Army break through at the Gabes Pass, over 100 miles into Tunisia and heads North. Kleist and Manstein are sacked by Hitler and replaced by Schorner and Model. In a raid on Nuremberg the RAF suffers its heaviest losses in single raid, losing 96 (600 aircrew) out of 795 bombers. The siege of Imphal begins, as the Japanese cut the road to the North. The U.S. First Army begins a 3 day battle for Paderborn. Russians troops finally capture Danzig, along with 45 U-boats and 10,000 prisoners. Breslau and Glogau are surrounded, 180 miles South East of Berlin. Russian troops cross the Austrian border to the North of Koszeg. German troops of Army Group Weichsel evacuate their last remaining bridgehead at Wollin to the North of Stettin.